Last changed on 07/30/2017. This album contains 2 items. This album has been viewed 1182 times since 01/22/2013. 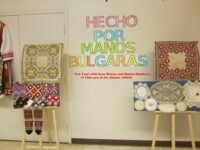 Cultural Gift to CCA by Dra Bouria Dimitrova (Dec 8, 2012). Last changed on 11/05/2018. This album contains 25 items. This album has been viewed 2326 times since 12/20/2012. This album has been viewed 1230 times since 12/09/2012. Last changed on 07/06/2018. This album contains 4 items. This album has been viewed 1048 times since 11/12/2012. This album has been viewed 1021 times since 09/24/2012.